Give 'em a raspberry! Filling, that is. 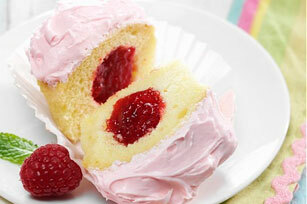 Thanks to their rosy-red frosting and berrylicious flavour, these cupcakes are ideal for a dessert buffet. Prepare cake batter and bake as directed on package for 24 cupcakes. Cool 10 min. in pans. Remove to wire racks; cool completely. Use small sharp knife to cut 1-1/4-inch-wide hole in top of each cupcake, being careful to not cut through to bottom of cupcake. Fill holes with raspberry jam, adding about 2 tsp. to each; cover with removed cupcake pieces. Mix sour cream, sugar and food colouring in medium bowl until blended; gently stir in Cool Whip. Use to frost cupcakes. Prepare using your favourite flavour of jam, such as strawberry or cherry.